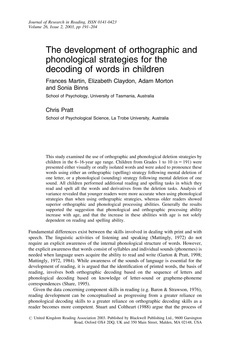 This study examined the use of orthographic and phonological deletion strategies by children in the 6�-year age range. Children from Grades 1 to 10 (n=191) were presented either visually or orally isolated words and were asked to pronounce these words using either an orthographic (spelling) strategy following mental deletion of one letter, or a phonological (sounding) strategy following mental deletion of one sound. All children performed additional reading and spelling tasks in which they read and spelt all the words and derivatives from the deletion tasks. Analysis of variance revealed that younger readers were more accurate when using phonological strategies than when using orthographic strategies, whereas older readers showed superior orthographic and phonological processing abilities. Generally the results supported the suggestion that phonological and orthographic processing ability increase with age, and that the increase in these abilities with age is not solely dependent on reading and spelling ability.